At a lavish ceremony on the grounds of Charleville Castle in Tullamore this morning, a crowd of over 12 people gathered to witness the President of Ireland Michael D. Higgins plant a tree to commemorate a much older tree. Known locally as the Kings Oak, the famous tree is believed to be around 900 years old. 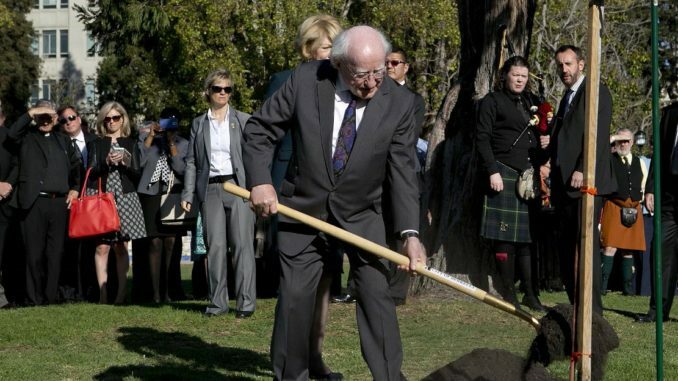 Having performed his ceremonial duties it was hoped that Mr. Higgins would not break into poetry as he normally does on these occasions but as local Gardaí were trying to shove him back into his chauffeur driven BMW, the tiny President managed to wriggle free and scurried back over to the tree where he recited a poem he had written especially for the occasion. I plant you here in Tullamorey. you’ll still be here when we’re all dead. in the hometown of singer Brendan Keeley. The President then made his way to the centre of town where he inspected a monument that was erected years ago in remembrance of something that happened even more years ago. “It has been a pleasure to come here to the great town of Tullamore to honour things and remember stuff.” he told reporters. President Higgins then left town and headed towards Mullingar where he was due to cut a ribbon at a ceremony to demolish the Joe Dolan statue and replace it with one of Niall Horan.